I occasionally go on binges of television shows that I never watched when they were actually airing on television (for one example, see my posts here about various episodes of the Simpsons). My parents didn’t condone a lot of TV-watching as I grew up, and as an adult, I don’t bother with wasting money on cable or even Netflix. However, I do have a library card, and many public libraries have vast collections of DVDs, including television series. This has afforded me the opportunity to do a tiny bit of catching up on some shows. My current TV show project, The West Wing, has thoroughly captured my interest and attention. As of this writing, I am about halfway through the third season of the series, and in the first minutes of episode 15, “Hartsfield’s Landing,” C.J. Cregg makes mention during a press briefing of the origins of the seventh inning stretch. Stretch time, she informs reporters, was founded by President William Howard Taft. Naturally this caught my attention, so I had to do a little poking around to find out whether this was true. It seems the actual origins of the seventh inning have faded with time, but the story of President Taft does circulate. According to the story, during a game he attended on April 4, 1910, the obese Taft stood up during the seventh inning to stretch his legs and find some respite from sitting in the small, wooden chair. When other fans at the ballgame saw Taft stand, they also stood in a gesture of respect for the commander-in-chief. Another possibility for the tradition’s origins dates back to 1869. According to an article in the New York Herald, following a particularly long second inning of a game between the Cincinnati Red Stockings and the Brooklyn Eagles, the entire crowd at the park simply stood up to stretch. Actual stretch time, of course, then was moved to later in the game. Today, of course, stretch time comes with singing the chorus of Jack Norworth’s “Take Me Out to the Ballgame,” as well as an end to alcohol sales for that game. Whatever the actual origins of the seventh inning stretch, there seems to be no doubt that it was borne out of a need for fans to take a break from the long period of sitting. Adrian Constantine “Cap” Anson was born on April 17, 1852 in a log cabin in Marshalltown, Iowa. He was the youngest son of Henry and Jeannette Rice Anson. Henry and Jeannette Anson had moved westward to the area from New York state with their oldest son, Sturgis, in a covered wagon, and young Adrian was the first pioneer child born in Marshalltown. Jeannette Anson died when Adrian was merely seven years old. Henry Anson enrolled his sons in a preparatory course at the College of Notre Dame, and then later again at the state college in Iowa City (now the University of Iowa), but Adrian Anson was more interested in baseball and skating than in his studies. As a teenager, Adrian earned a place on the town baseball team, the Marshalltown Stars. With Henry Anson playing third base, Adrian’s brother Sturgis in centerfield, and Adrian at second base, the Stars went on to win the Iowa state championship in 1868. In 1870, the Rockford Forest City baseball club and its star pitcher, Al Spalding, came to Marshalltown for a pair of games. The Forest City team won both games, but the Anson men played so well that Rockford management sent contract offers to all three of the Ansons. Henry and Sturgis turned the offer down, but Adrian accepted and joined the Forest City team in the spring of 1871. Adrian Anson batted .325 for Rockford while playing third base, but the team disbanded at the end of the season. He was then signed by the Philadelphia Athletics, where he batted .415 in 1872, third best in the National Association. In 1874, Cincinnati Red Stockings manager Harry Wright and pitcher Al Spalding organized a three-week trip to England. Both the Athletics and the Red Stockings sailed across the Atlantic to play both baseball and cricket in front of British crowds. Anson led both teams in hitting throughout the tour, and he and Spalding developed a friendship during this trip, as well. Anson’s numbers declined slightly in 1874 and 1875, but he still captured the attention Chicago White Stockings president William Hulbert. Anson signed with Chicago, and he went on to be named captain-manager of the club in 1879, moving across the diamond to play first base. His new role as captain-manager led to his nickname, “Cap,” short for “Captain Anson.” Under Anson’s leadership, the White Stockings won five pennants between 1880 and 1886. Anson introduced new tactics to the game, including the use of a third-base coach, having fielders back up one another, signaling batters, and the pitching rotation. 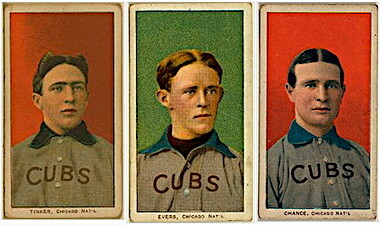 Anson played twenty-two seasons for Chicago, hitting at least .300 in twenty of those years. 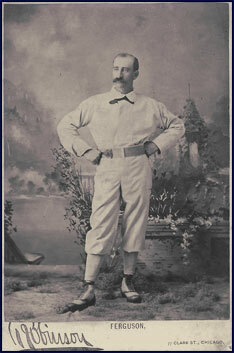 He led the league in RBIs eight times between 1880 and 1891, winning batting titles in 1881 and 1888. He retired after the 1897 season at the age of forty-five, having collected big league records for games, hits, at-bats, doubles and runs. He also finished with 3,081 hits, making him the first player ever to cross the 3,000-hit line. After leaving Chicago, Anson managed the New York Giants for 22 games in 1898 before his big league career came to an end. He died on April 14, 1922 and was inducted into the Baseball Hall of Fame in 1939. Speaking of Tinker, Evers, and Chance, the legendary double-play combination completed their first-ever twin killing 113 years ago today, on September 15, 1902. As we know now, it was the start of a relationship that would become immortalized in Franklin Pierce Adams’s “Baseball’s Sad Lexicon,” as the Cubs defeated Cincinnati, 6-3. By the way, if you’re interested, the Chicago Tribune published a short article about the story behind the poem here. Here’s a photo from LIFE magazine taken in September 1956 during a doubleheader between the Cincinnati Redlegs and the Milwaukee Braves. On the left is Ted Kluszewski of the Redlegs, and he is speaking with Braves manager Fred Haney. 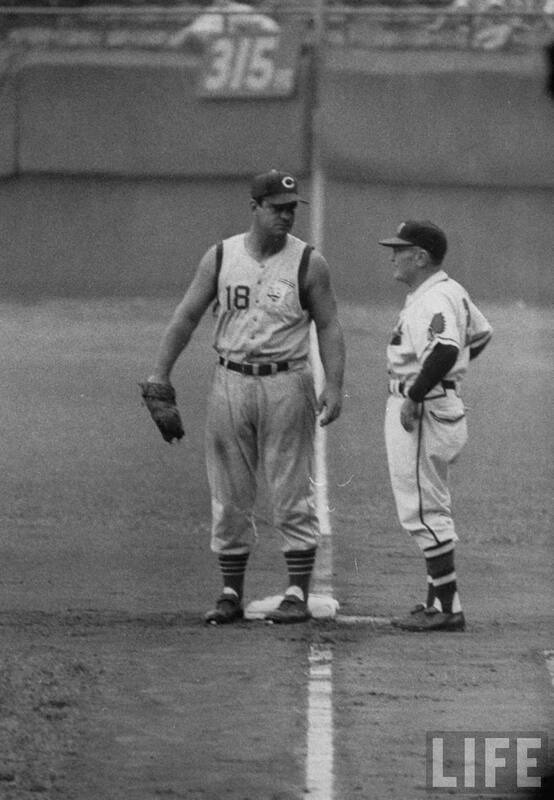 I, for one, sure am glad that the sleeveless look never took off in baseball. Something interesting I learned as a result of finding this photo: the Cincinnati team was known as the Redlegs from 1953 through 1958, due to the Red Scare in America. Even though “Reds” had been inspired by the old Cincinnati Red Stockings, people have a way of letting fear dictate their reactions to things sometimes. The term “Reds” became associated with Communism, and from 1956 to 1960, the name “Reds” was removed from the team’s logo and no longer appeared on the team’s uniforms. The name “Cincinnati Reds” was restored to the team after the 1958 season. The first recorded trade in major league history took place on November 15, 1886 when the Cincinnati Red Stockings of the American Association dealt rookie catcher Jack Boyle and $400 to the St. Louis Browns in exchange for outfielder Hugh Nicol. 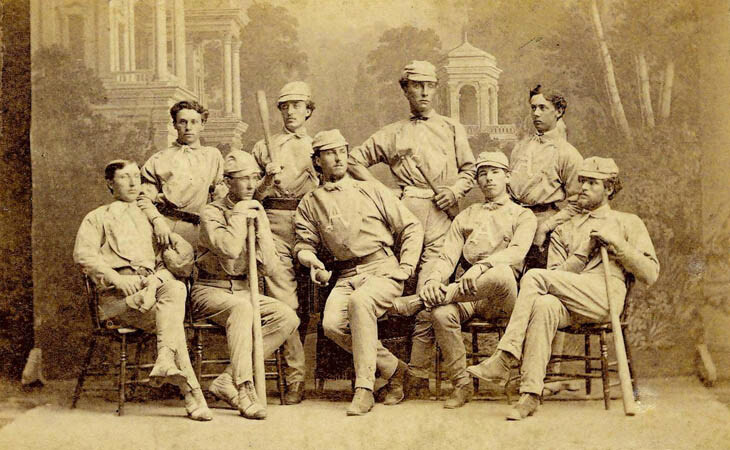 On May 31, 1869, a downpour of rain postponed a game between the Cincinnati Red Stockings and the Antioch Nine, a college team regarded as the most talented amateur clubs in the state of Ohio. The game would have been the first of the Red Stockings’ inaugural professional tour, but instead it became the first rain out of a professional baseball game in history. In a game against the Cincinnati Red Stockings in Brooklyn, the Atlantics’ infielder Bob Ferguson led his team to an 8-7 victory that ended the Red Stockings’ 81-game winning streak. 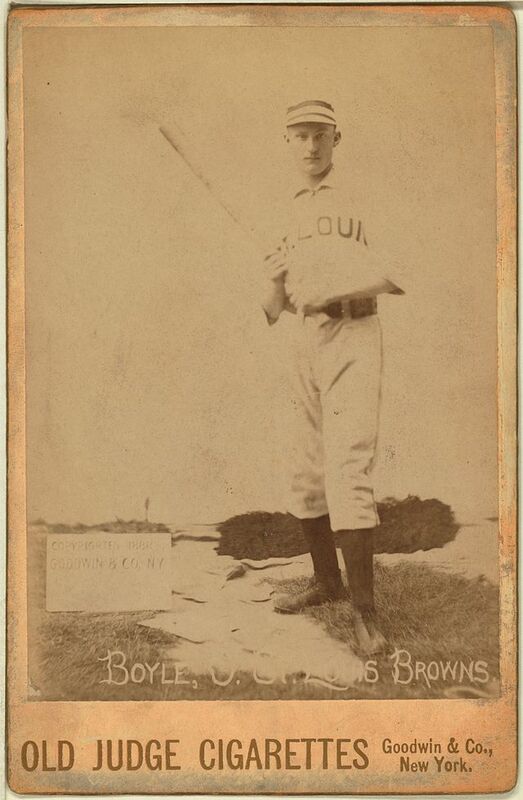 In an effort to avoid hitting the ball to the Red Stockings’ star shortstop, George Wright, Ferguson opted to bat from the left side of the plate, making him the first known switch-hitter in professional baseball.